No idea, why the notes say "recorded live at an unknown date and location". This is a collection of Zappa playing the material of his "Lather"-box on the radio, circa 1977. "Lather" back then was blocked by Warner, and the material soon appeared in 1978/79 on four different releases without Zappa's consent: "Live in New York", "Studio Tan", "Orchestral Favorites" and "Sleep Dirt". 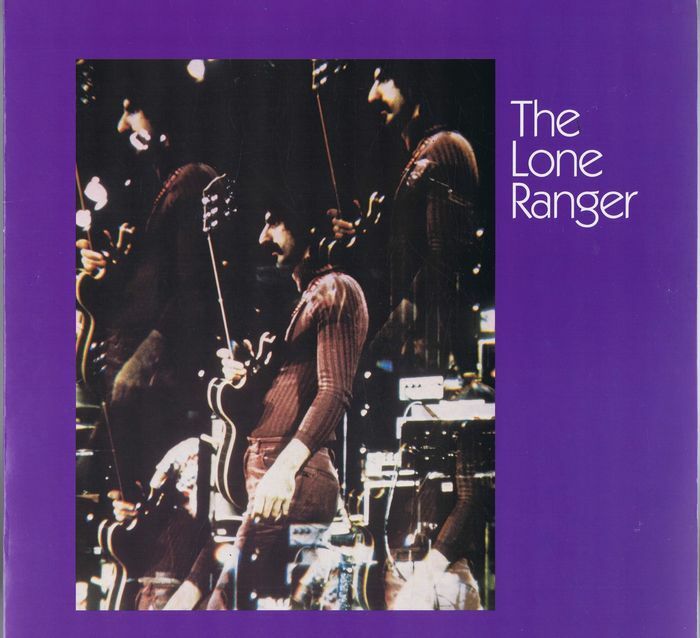 "The Lone Ranger" sure includes some live material, but it is very well known when and at what locations this has been recorded (for details check the mentioned releases, or the finally Zappa-self-released "Läther"-CD-box). 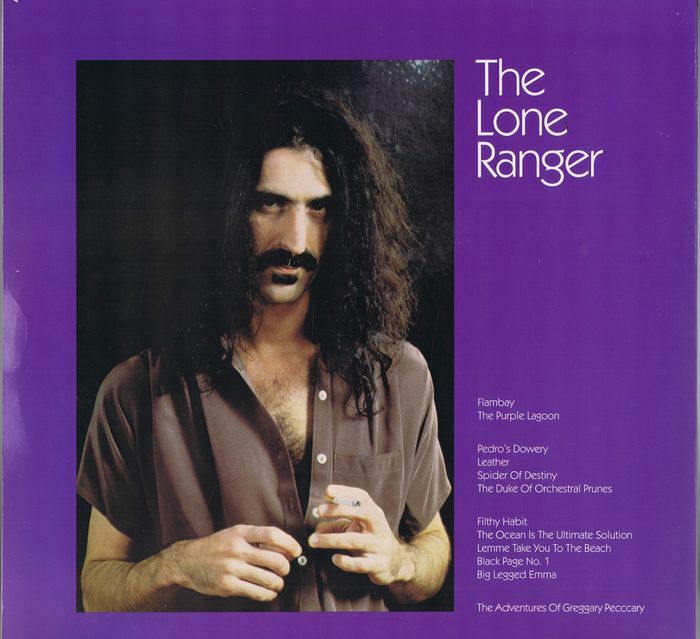 The cover has a picture of Zappa from the 200 Motels sessions, shot with a caleidoscope lens. The back cover has a Zoot Allures era picture. The labels are dark blue with track lists, vinyl sides, and copyright notes. The artist is identified as Jazzmen. Sides 1, 2, and 4 have the letters PF below the matrix numbers - compare this to official Warner Brothers releases. Pressed in both black and blue vinyl runs. Thank you for the info folks. Any idea who performs on the live section by chance? Throw your worthless bootleg in the trash where it belongs and pick up the official item while you're at it. There is nothing on this bootleg that is not on the official Läther release in better quality. Don't kid yourself. Good point. There are also no degrees of worthlessness. I'm not trying to berate anyone. It's your money, spend it how you like. If you bought your LP as an investment or you just like the cover, knock yourself out, but you don't strike me as a collector. I certainly have a TON of bootlegs, some of which I'm happy with and some of which I feel pretty ripped off about. But I also own the complete Zappa catalogue, which should be a person's focus before venturing out into the grey world of unofficial releases. However, it seems there are more than a few young and new Zappa fans here (God bless you, the world needs more of you) that I feel could use a little advice to keep them from getting ripped off as much as I did back in the pre-internet days. If you're unsure about what's on a bootleg title, the Zappa Patio is still a great resource although it hasn't been updated for a while. For the record, although I don't own the Lone Ranger LP, I do own Leatherette, Pa's Nose Fell Off at Breakfast, the Edison 4-LP box and the 4CD Läther-Box, all of which I was thrilled to own at one time and none of which I play anymore once the ZFT released Läther officially. If you're truly interested in the music this is the only one you need to listen to. Universal Music has re-released (pretty much) the entire Zappa catalogue in the best quality currently available. The ZFT gets royalties from sales of this stuff and this allows them to keep releasing the fantastic stuff they do. Don't give money to anyone else, everything else is available for free elsewhere. The third BTB set is mostly from a bootleg called Apocrypha, which is pretty easy to find, as are all the other boots in the sets. However, if you send me a PM with your mailing address I will send you a USB with all three BTB sets on it. State your preferred format. My problem is not with bootlegs. Rather, I object to the improper use of the word "unique". The word "unusual" would have been appropriate. 1. a unique person or thing. a person who collects books, paintings, stamps, shells, etc., especially as a hobby. It has nothing to do with loving music. Every bootleg I ever owned was acquired because I just had to hear the music.